We often get calls and emails asking how it’s possible to use the number one in a registration plate. We wrote this page for you so that you can find out a bit more about these special registrations and get some ideas for your own ‘1’ personalised registration plate. The registrations listed at the bottom of the page all link to registration search results – allowing you to see the price of the registration and alternatives. We hope you find this page useful. Short registrations are valuable and short ‘1’ plates have a history of being sold for large amounts and appreciating over time. Traders consider 1 *** or ** 1 (where * is any letter) to be the most prestigious and valuable registration combinations. For example, JEN 1 would be worth 4 or 5 times the value of JEN 2 or JEN 3 and likewise this rough rule of thumb can be applied to other combinations of initials and names. We have top class high value 1 plates with 2 and 3 initials. The more common the initials the higher the value of the registration; MB 1 has changed hands for £250,000+ and 1 RR was sold in the last 10 yrs for around £200,000. CarReg have brokered deals for plates such as MJB 1 and 1 COX for figures in excess of £50,000 so if you are interested in buying or selling these registrations we can help. S1 hit a world record price in September 2008 when it sold for £397,500 at Bonhams number plate auction. It was first bought in 1903 by Sir John H A MacDonald, one of the founders of the RAC. S 1 is currently for sale so if you are interested then contact us so we can pass your offer onto the seller. Max Bygraves owned MB 1 which Mercedes Benz wanted to buy from him. Max held onto this registration until he emigrated to Australia when he sold it and his Rolls Royce to a lottery winner. Sir Alan Sugar is proudly chauffeured around in his Rolls Royce Phantom bearing the mark AMS 1 which was often featured during the TV programme The Apprentice. 1 D was sold in a DVLA auction in 2009 for £352,411. For some reason the DVLA only issued it that year even though they sold its mirror D 1 in 1903. If you are curious about how DVLA auctions work, have a look at our video of the 1 D auction below. If you want to buy or sell at auction just get in touch with us about our auction service. 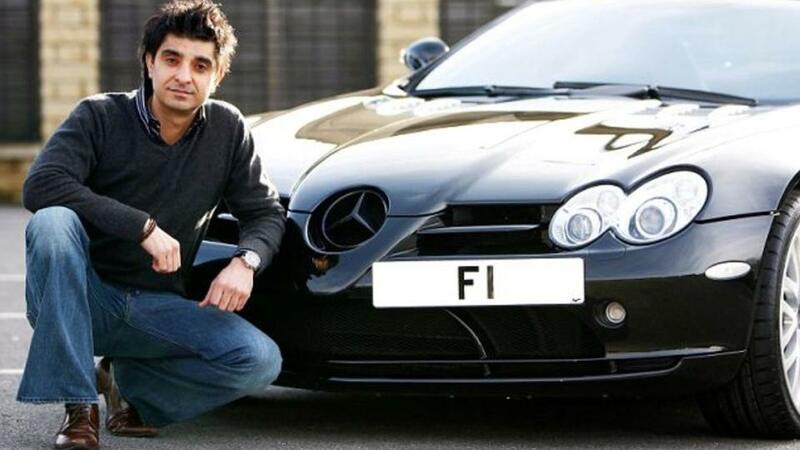 F 1 was first issued in 1904 and it made UK records in 2008 when a Mr Afzal Kahn bought it for £440,000 from Essex County Council. Afzal received offers for it of £5 million in 2012 and £6 million in 2013, both of which he declined. We have thousands of registrations for the F1 fan. They all start with F1 and then three letters which you can choose. They are priced from a fantastic £1,200. See our F1 private plates! Mirror plates are registrations with the number and letter combinations reversed. For example 1 JDW is the mirror of JDW 1. If you can’t have one you might be able to buy the other or you could have both for different cars! Chris Evans loves his cars and he buys some pretty good registrations for them too. He bought FAB 1 at auction for the FABulous sum of £5.6 million. He must have really wanted the set because he also owns it’s mirror 1 FAB. If you think this registration sounds familiar then you are probably a Thunderbirds fan because it was the registration used on Lady Penelope’s pink Roller. Chris Evans has been working with Rolls Royce to raise money for Breast Cancer Care. Rolls Royce provided a pink car and he provided the registration. The car is now used in charity events, premieres and rented out - all in aid of this fantastic charity. In 1903, Earl Russell sat up all night in order to be the first in the queue for this illustrious registration number. His nearest rival was only 5 seconds behind him! In 1906, his Napier car was acquired by the Chairman of the London County Council along with the registration. A year later they were sold to the Head of Maudes Group Motor Business, George V Pettyt. 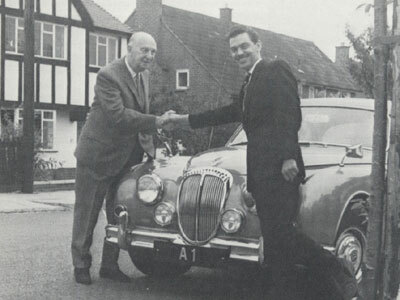 Over the years, George transferred the registration to each of his successive vehicles, including; a Jaguar, Morris Isis, Singer, Daimler, MG, Alfa Romeo, and the last being a Sunbeam Talbot 90. In 1950, George sadly died. In his will the Sunbeam and the registration were passed on to Trevor T Laker. The first time a number plate had been mentioned in a will, but it came with a request that Trevor use it until his own demise, and then the number should be sold and the sale proceeds donated to a charity for dogs. In 1970, £2,500 was raised from selling to Dunlop Holdings Ltd, and was donated to the Guide Dogs for the Blind Association. 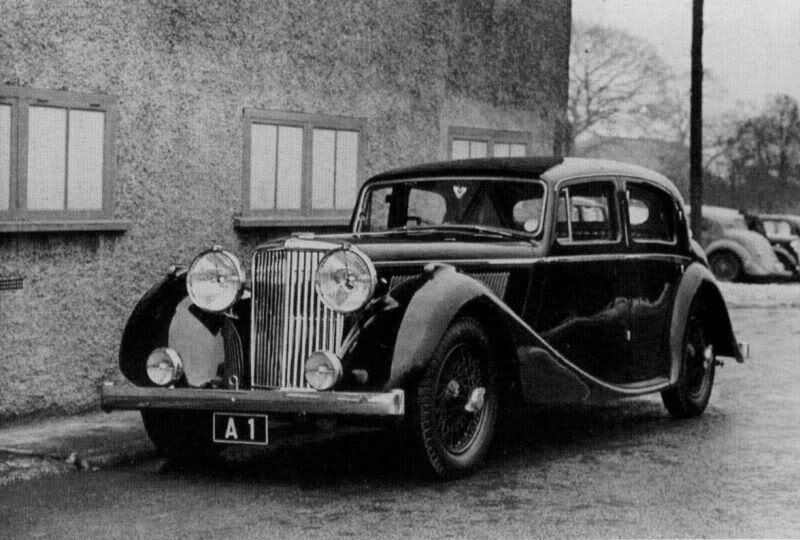 A 1 was transferred to a Daimler Limousine which was used to transport important guests to and from the Dunlop factories. Later it was transferred to the Tyre Division for extensive promotional purposes, with a brief period in 1975 where it was used on an Executive Mini driven by the Director of Engineering. Following the acquisition of Dunlop in 1985, ownership was passed to BTR plc. Then in 2005 the late Roy Palmer of Insignia Registrations sold both A 1 and 1 A, transferring them to two identical Bentleys ready for the new owner, Prince Jefri Bokiah (younger brother of the Sultan of Brunei), to be collected from the airport - It is doubtful that the registrations will become available for sale any time soon! Request a FREE number plate valuation now if you wish to sell your registration either immediately or in the near future. Short, memorable and name plates are in high demand. Looking for a super plate? Are you looking for a very special number plate? The ultimate private number plate investment? We have a large selection of the finest sought after 2 and 3 digit private plates in the UK. We call them ‘Super Plates’.